This is the second detective novel Harry Potter creator J.K. Rowling has written under the pseudonym Robert Galbraith. Her crotchety but lovable private detective Cormoran Strike returns, along with his eager assistant Robin, once again determined to solve a case that the police won't be able to crack on their own. Owen Quine, a writer of only moderate fame, has gone missing. His awkward, dour wife Leonora hires Strike to locate him. Her husband has a habit of running off with mistresses, and Leonora doesn't want to involve the police yet again. Quine has recently been at the center of the literary world's gossip, thanks to the leaked manuscript of his latest novel, a gruesome tale rife with symbolism and reportedly full of damning portraits of real people, everyone from his publisher to his wife to his bitterest rival writers. Both Leonora and Strike assume Quine is hiding from the furor the manuscript has produced and will turn up again after the dust has settled. And he does—but by that time, only his body is left. Quine has been brutally and ritualistically murdered, in exactly the same manner as the main character in his novel. Suddenly Strike is hunting not a runaway writer, but a devious killer who has proven to have a great flair for planning and details. Already a master of children's fiction, Rowling has proven herself an adept mystery writer as well. 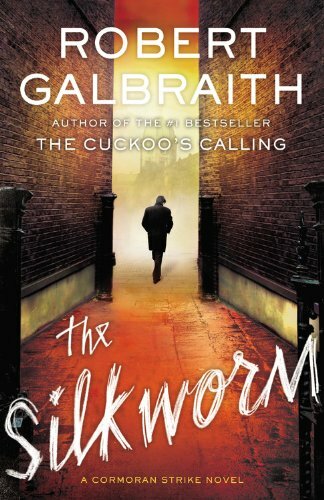 The Silkworm is a fun, fast foray into the sometimes cutthroat world of publishing, and Cormoran Strike is charismatic enough to keep us coming back for more. If you haven't had the pleasure of reading Rowling's first Cormoran Strike novel, The Cuckoo's Calling, you can see my recommendation for it here.